In addition to a long list of guests, the three new stages of Alzheimer's disease will be discussed: preclinical Alzheimer's, mild cognitive impairment, and Dementia because of Alzheimer's. Larry King returns to CNN with an emotional look at how people cope with Alzheimer's disease. Don't miss "Unthinkable: the Alzheimer's Epidemic," tonight at 8 ET on CNN. Tonight, I will put up an article so that you can add your comments and opinions about the show. You can use the ADD NEW Comment area to submit your comment or opinion. This way all comments will be in one place. Please do not respond to the email alert if you want to add a comment. Use the area below that article. If you want to write a long opinion piece you can submit it using the Contact Button in the navigation bar (upper right hand corner). Please include the words, King Special, in the subject box of the email to insure the opinion you are submitting gets noticed immediately by me. To see additional video previews with the guest on the show go here -- Larry King Special. This page includes video previews with Maria Shriver, Seth Rogen and his finance, Angie Dickinson, David Hyde Pierce, and Ron Reagan. 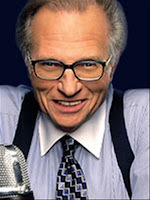 Larry will be joined by people who have been touched by Alzheimer’s disease and will include interviews with former First Lady Laura Bush and California’s former First Lady and Alzheimer’s activist Maria Shriver; actors Seth Rogen, and Angie Dickinson; TV host Leeza Gibbons; football star Terrell Owens and son of President Ronald Reagan, Ron Reagan. Neurosurgeon and CNN chief medical correspondent, Dr. Sanjay Gupta will explain what Alzheimer’s is and how this disease affects the human brain. Seth Rogen, talks to King about supporting his fiancée and her family as they deal with her mom’s early diagnosis at the age of fifty-five. He wants the world to know this is a young person’s problem too. In addition to visiting the Mayo Clinic, Larry King will visit the cutting-edge Lou Ruvo Center for Brain Health at the Cleveland Clinic in Las Vegas, and he will be joined by Ron Reagan. While there, one of them will take a brain scan that will indicate if he is at risk for Alzheimer’s or other memory disorders, and one will opt out.